Cyber Rag I, II, III and the more recent Electronic Hollywood—arty disk magazines for the Macintosh—are lighthearted frolics into somewhat uncharted electronic space. There aren’t many disks to subscribe to these days, nor computer artists producing them. While magazines are collections of static images, the pages of these electrozines come alive with sound and animation. Nothing too heavy here, just 800K of angst animations, goofy games, premenstrual poetry, rambunctious reviews, seductive sound samples. The appropriately appropriated Hacker Manifesto and a subversive "how-to" on using pay phones without paying sets the tone early on. Isn’t that against the law? Not Ms Levy’s law. If you’re still with us, click into the effluent world of sperm as it goes on an animated egg-hunt, set to a funky industro-beat. Nestle up to an interactive Noriega as he runs around Panama (you try to catch him). Move on to a Persian Gulf poem-in-motion where battleships on a cyber-sea, bombarded by incoming missiles, bob to a digitized "Give Peace a Chance." Kuwait is free, but we paid the fee, we’re reminded. Then, if you’re in the mood, slip into a slam-dis on "hippy dippy shits" whose "tie-dye shorts make punk rock look almost fresh." 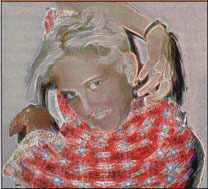 Here, as elsewhere, Levy tries vigorously to shake the vague psychedelic aura that clings to computer art. One of the more irreverent offerings of Levy’s disk rags are her bratty/catty trade show reviews. She gives us the lowdown MACWORLD left out. As a regular feature, Levy tells us how she wangled her way into overpriced trade shows (try $800), and then the coolest and lamest things about them. Apparently Levy didn’t like the Virtual Reality conference in San Francisco where a bunch of academics got together to "make lots of rules and definitions." The coolest thing was free water. "Hearing William Gibson referenced as if he discovered the planet ‘Cyberspace,’" was the lamest. That time Levy got in by color-xeroxing a friend’s badge; another time she pretended to be a production assistant. Levy junketed to Las Vegas where crashing SIGGRAPH ’91 was "no problemo, since plenty of trade show passes were sitting only yards from the registration table." At the Intertainment conference last October, she spoke on a panel (Interactive Magazines—The Next Publishing Revolution?) and so, she tells us, "no scamming necessary." The coolest thing about this gathering was "saying stupid things out loud to adults in business suits." Tongue out of cheek, Levy says, "These trade shows are supposed to be about computer graphic art, but the artists can’t even afford to go." Crashing them, then, becomes a political statement. The first two Cyber Rags were programmed in HyperCard, the next two in Macromind Director. Basically you need 3 megs of RAM and a Macintosh to enter the rebel world of Jaime Levy. Electronic Hollywood requires a color monitor. With the variety of hardware out there, she says, some crashes are inevitable. Cyber Rag I was Levy’s NYU Master’s Thesis project in the film school’s Interactive Telecommunications program (the techno-punk road to higher learning). That was after she skipped the "early retirement community" of San Francisco State where she majored in film/video production. It was in the hallowed computer lab at SF State that she fell in love with the nerd who introduced her to the Macintosh Interface. It’s all history for the chroniclers of electronic publishing, since luckily she found it "more interesting than him." Then on to Los Angeles, land of her birth, the place with a "bigger hard drive," tanned cyber-brats, and way more opportunities for employment. Levy supports her habits (electronic and otherwise) working as a computer graphic artist. Characteristically flip, she’ll tell you that to produce a disk magazine "you gotta be a drug dealer to afford to take a couple months off to sit around your computer." Oh, but you wouldn’t do that, now would you? "No way!" she says. "I’m a prostitute."